Enjoy your extended stay in Glacier National Park from one of our 12 new log cabins, or come for a peaceful nights lodging while traveling through our area! We are centrally located for access to all eastside park locations and activities. Each cabin provides a modern bathroom with shower, one or two queen size beds, picture window sitting area, and front sitting deck over looking an aspen grove with mountain views. A short creekside and upper meadow walk will reward you with one of the most panoramic views of Glacier National Park and the St. Mary Valley. We have a new picnic/pavilion with kitchen, restroom and shower, picnic tables, outside grill and central fire pit. Complimentary coffee, juice, toast and cereal. If you enjoy fishing, hiking, biking, relaxing, wildflowers, fresh air and sunshine, wildlife, peace and quiet, starry nights, panoramic views, cross-country skiing, berry picking, the smell of pines, and the glorious gold of quaking aspen in the fall, call us for reservations. Cancellation Policy: We make a special effort to accommodate guests who need one or more cabins for a block of three or more nights. Please be sure of your travel plans when you call to reserve. We accept MasterCard, Visa, and cash. 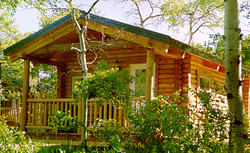 Reservations require a 50% credit card deposit, (one night minimum) at the time the reservation is made. Customers who cancel at least 30 days prior to their arrival date will receive a refund of their deposit, minus $20.00. The deposit is NON-REFUNDABLE to customers who cancel, for any reason, with less than 30 days notice. Guests will be charged for each day reserved, regardless of early departure. Directions: Glacier Trailhead Cabins are located in a shady aspen grove on Highway 89, 3 miles north of St. Mary, at the east entrance of Glacier National Park. We are just 15 minutes from the Canadian border, and approximately 3 hours from Great Falls, Kalispell and Calgary, Alberta.